Plantago lanceolata, the plantain found in the high carbon dioxide springs. The research, published in the journal Global Change Biology, provides insight into the long-term impacts of rising CO2 and the implications for global food security and nature conservation. Lead author Professor Gail Taylor, from Biological Sciences at the University of Southampton, said: “Atmospheric CO2 is rising – emissions grew faster in the 2000s than the 1990s and the concentration of CO2 reached 400 ppm for the first time in recorded history in 2013. 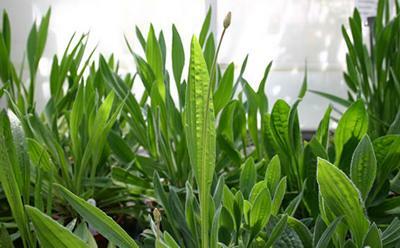 “On the one hand, more CO2 is known to be good for plants, at least in the short-term because this drives up photosynthesis and plant growth including crop growth and food production. Indeed recent decades have seen the planet becoming greener as vegetation growth is stimulated as CO2 rises. To address this problem, the researchers used a unique resource – naturally high CO2 springs where plants have been subjected to more CO2 over many hundreds of years and multiple plant generations. 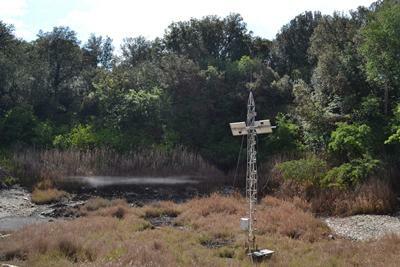 Taking plantago lanceolata plants from a ‘spring’ site in Bossoleto, Italy and comparing the molecular signature with the same plants from a nearby ‘control’ site (at today’s CO2) revealed striking differences in the total gene expression (the process by which specific genes are activated to produce a required protein). Professor Taylor said: “The study shows that when we take plants from these two places that represent the atmosphere of today with that of the future (out to 2100), and place them together in the same environment, the plants from spring sites were bigger and had a better rate of photosynthesis. Most importantly, plants from the spring sites had differences in the expression of hundreds of genes. One of the most interesting findings was that stomatal pores on the surface of the leaf (small holes that control the uptake of CO2 for photosynthesis and the loss of water vapour) increase in number after multi-generation exposure to future CO2. The team predicted that pore number would decline, in line with past research over geological timescales using fossil plants. Professor Taylor added: “This is a counter-intuitive finding but strongly suggests that stomatal pore numbers increase, since we have identified several key regulators of stomatal number that are sensitive to future high CO2. One of those is SCREAM (SCRM2), which is a member of the basic helix-loop-helix (bHLH) protein family that acts to regulate plant developmental transitions. This research was funded by the FP7 Framework for Research Programme of the EU, as part of the EXPEER consortium ‘Experimentation in ecosystem research’, NERC and the British Council. 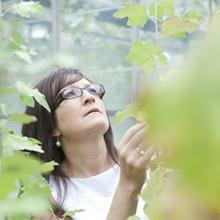 Professor Gail Taylor is a leader in Plant and Sustainability Science, where her research focusses on the challenges of sustainable energy and food production and adaptation of biological systems to the changing climate.